Go to Shop ´n´ P.L.A.Y. Student expectations, performance outcomes, standards, and benchmarks by the end of grade two (or grade five; or grade eight). Participates regularly in physical activity and achieves and maintains a health-enhancing level of physical fitness and demonstrates understanding of fitness principles and concepts. Demonstrates clear contrasts between slow and fast movement when skipping (or hopping, galloping, sliding, etc.) (NASPE Standard 1). Demonstrates clear contrasts between heavy and light movements while traveling with various locomotor movements (revised NASPE Standard 1). Travels over and under objects and partners using locomotor skills (CA Standard Grade One; 1.2). Travels in front of and behind objects and partners using locomotor skills (CA Standard Grade One; 1.2). Compares and contrasts changes in heart rate before, during, and after physical activity. Discusses the demands on the heart during slow vs. fast movements (CA Standard Grade Two; 4.8-revised). Works in diverse group setting without interfering with others (NASPE Standard 5). Demonstrates the characteristics of sharing and cooperation in a physical activity setting (CA Standard 5, Grade One, 5.3). Newsletter topic/written assessment: States reasons for safe and controlled movements (NASPE Benchmark for Second Grade). Identifies appropriate behaviors for participating in physical activity (NASPE Benchmark for Second Grade). Teachers enter student information,enter scores based on student performance during the unit, have grades and reports calculated and printed, then share the information with parents and administrators with the click of a mouse! Scores for students are averaged - 20% skill; 20% cognitive; 20% personal responsibility; 20% social (respects, appreciates, enjoys); 20% understanding fitness principles. Rubric: 5 points = Advanced; 4 points = Mastery; 3 points = Proficient; 2 points = Progressing; 1 point = Practice Encouraged; 0 points = no attempt was made; blank = student absence. Grade Level: Student achievement goals are automatically calculated by grade level. Tandalay’s and NASPE’s standards are based on grade levels K-2; 3-5; and 6-8. The goal for kindergarteners, third graders, and sixth graders is to achieve a score of "Progressing." Although the printout will show the number (2, 3, or 4), the overall score - or percentage - for that score will be reflected as 100% - goal achieved! The goal for first graders, fourth graders, and seventh graders is to achieve a score of "Proficient." The goal for second, fifth, and eigth graders is to achieve a score of "Mastery." A score of “Advanced” will reflect the 100%, while providing the appropriate feedback for the student and parents regarding the student’s outstanding achievement. Comprehensive, yet flexible.We have focus standards included in each Tandalay Unit of Instruction. MyPEScore can be used with the Unit Standards as presented or you can enter and evaluate according to your own standards. 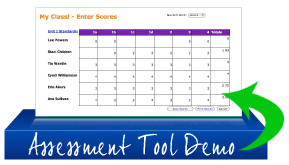 Simply enter your assessment criteria and the software takes care of the rest! Finally – a quick solution for grading physical education that reflects the whole player! No more reliance on “dressing out” or vague perceptions of “participation.” Give credibility to your program, and to the importance of fitness, health, and the Joy of PLAY! Have fun!!! Who knew it could be so SIMPLE and REWARDING to teach PE to the standards?